Vincennes and Sèvres produced lorgnettes in a variety of sizes. An ivory-mounted Sèvres example dated circa 1756 and decorated with a trellis of green ribbons enclosing flowers is in the collection of the Louvre. Another, dated circa 1765 and in the Wrightsman Collection at The Metropolitan Museum of Art, is painted with a terrace of flowers within gilt lacy borders and mounted in brass (Carl C. Dauterman, The Wrightsman Collection Porcelain, Metropolitan Museum of Art, New York, 1970, vol. IV, no. 90). See Marcelle Brunet and Tamara Práud, Sèvres des origines à nos jours, Paris, 1978, no.95 and Pierre Verlet et al, Sèvres, 1953, p. 210, pl. 51b for a discussion of the above-mentioned examples and others. 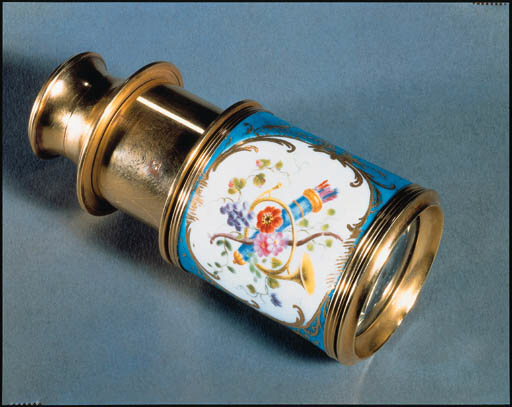 The records of the marchand mercier Lazard Duvaux note many sales of spyglasses including one to the Maquise de Pompadour on 22 December 1756 for 180 livres of "une lorgnette de Vincennes garnie d'or" (a Vincennes spyglass mounted in gold).